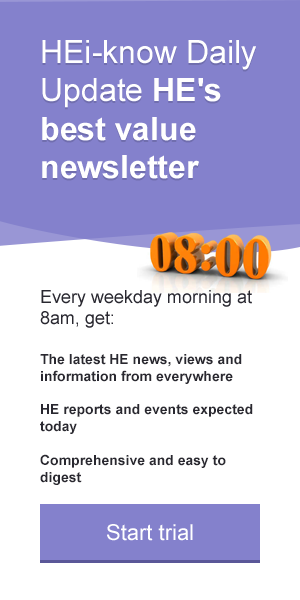 Being asked to kick off a new series of blogs commenting on the significant pieces of news in the past week for HE, the first worry is would we get one of those quiet weeks where in fact there is nothing really interesting? However given the last 18 months this of course was never likely to be the case and we look forward to the time when it can be announced that nothing of any real import happened last week in the HE sector - now that would be a story! So what to choose - there was the end of cycle UCAS report revealing that the number of applicants fell in line with the demographic dip, but numbers admitted held up -- suggesting that despite the relentless knocking of universities and questions of value for money, 18-19 year olds still see this as an attractive option, including those from under-represented groups. The survey also revealed that around one third of offers were unconditional, which is an astonishing increase since 2013 when it was only 2 per cent. It should be noted this translates to 22.9 per cent of applicants receiving at least one such offer. The controversy around this is not going away. The provider level data to be released in January 2019 will likely make interesting reading. However, there needs to be a real understanding of the 7 per cent difference on subsequent performance of missing predicted grades by two or more, (including better analysis of e.g. socioeconomic and school impact) as there could be several explanations. A second story was the interesting call for a business levy in a HEPI report as an example of ways of spreading the cost of Higher Education. All avenues should be explored for underpinning the HE sector with sustainable funding. However, probably the big story of the week was the DFE-commissioned IFS report examining graduate earnings by discipline and provider. The use of LEO data to measure the value of a course related to the Teaching Excellence Framework and the concept of ‘return on investment’ to the student have become increasingly high profile. The report generated a lot of column inches, but what did it tell us? Some courses provide better premiums than others and some institutions provide better premiums than others. We would have been very surprised if economics and medicine had not been at the top and creative arts at the bottom. What is not clear in both the discipline data, but especially the institutional data, is what overlay has there been of the raw earnings data with the social background profile of the students? We are no defenders of poor courses that produce poor outcomes, but being clear on the earnings data about what one can really define as ‘poor’ is important. What can reasonably be expected and what actual added value is there for a particular student given their individual circumstances needs to be understood. However as the, now former, universities minister Sam Gyimah said, the data shows that on average the graduate premium is ‘holding up’ as it remains real, significant and robust. There are also the intangible aspects to value, including improved health, quality of life, engagement with societal issues and intellectual satisfaction. They’re more difficult to quantify, but very important. Data was also in the news with the publication of the OfS Data Strategy 2018-2021 which sets out their approach to use of data for regulatory purposes. Their focus on only requesting data that supports their functions will reduce the amount of data required from providers. Reducing burden should be welcomed, but some datasets which are no longer required have been a very useful source for institutions to benchmark their performance and cost base, particularly to assess value for money of professional services and estates costs. Institutions may increasingly look at other ways to benchmark at a time when there is heightened interest on how fees are spent. The question of how value for money is defined remained central to the sector news last week and is likely to remain in the headlines for the foreseeable future. Then to cap it all, just as we wrote this review, our universities and science minister resigned!